This issue begins with Scott Edelman’s allowing the “readers to write the editorial.” In his piece, he sums up the top 10 stories as voted on by the readers. I listed the tabulation in my writeup for September 1993, but in the additional issues that appeared since, I would make one change to my original listing: In the #1 spot I would put William Shunn‘s “Two Paths in the Forest Toulemonde“. Everything else would shift down by one. I think Bill’s story is one of the finest pieces of fiction to appear in the run of the magazine. While we’re talking space development, my prediction is also that there will be no space station, not as presently planned. The plans call for 20 plus successful shuttle launches, plus a lot of Russian launches. That is not going to happen. There is no shame in predictions like this. In a way, it is a safe prediction because if it comes true, Andrews predicted it, and if it doesn’t, it means our space program was more successful than he imagined it could be. This issue contained six pieces of fiction. If there was a theme to tie the stories together in this issue, I think it is one of class or caste, or a person’s place in society, relative to others. This is the story of a researcher trying to get access to a space station for his research. It is up to his old man to pull some strings for him to finally get him onboard and so this is the first example of the class theme in this issue. The story really gets interesting with the introduction of the mysterious Rayla and her dog and it eventually evolves into a love story. It was a fun story to read. Gene O’Neill makes the caste theme explicit with his “Down on the 01 Level”. In this world, classes are literally separated by levels within the overall city. “Bobbing” is cruising outside your own level and it’s what our narrator, Sandoval, and Oberon decide to do, mostly for the thrill of it. They live up in the high levels and decide to go bobbing down the lowest level. There is a good overall story arc here and a nice little twist at the end of the story. In reading this piece, I was reminded of Robert Silverberg’s The World Inside, with it’s towers and complicated sexual unions. (In O’Neill’s piece, people formed “quad-bonds” and I never understood this idea, even in Silverberg’s books), but it still made for an interesting story. Aldridge’s story approaches the class/caste theme from the point of view of master and slave–where the slave is a former freer of slaves, and emancipator. What I liked most about this story was the world that Aldridge envisioned, the living, breathing biomantic as a kind of world-person, an ecosystem of sorts. This is a story of deception and rebellion and one of a growing fondness and appreciation of the true nature of things. I believe this is Paul’s third story in Science Fiction Age and in my opinion, it usurped Daniel Hood’s “Wealth of Kingdoms” as the funniest story–so far–to appear in Science Fiction Age. I felt like I was laughing at almost every sentence. First there is the deliberate (and for the story, appropriate) overuse of trademarks. Second, is the style in which the story is written, almost like a pulp hero story or a superscience story from a 1926 issue of Amazing. This story was hilarious from story to finish. I was tempted to count just how many name brands Paul managed to mention in the story–but I resisted. I was confused by Benford’s story at first because the blurb on the cover of the magazine referred to “California Timequake”, but I didn’t see how time played a role in the story that followed. (Maybe I was thinking of Kurt Vonnegut’s Timequake, which of course had not yet come out when this story appeared.) The story itself is written in the form of a radio announcer talking to people “on location” of a massive 8.1 earthquake in southern California. Keep in mind this story appears in the May 1994 issue. The Northridge earthquake took place in January 1994. My parents, who lived in Northridge at the time, had to move out of their house for 9 months while the damage was repaired; I was 80 miles east at UC Riverside when the quake hit. In reading the story, I wondered when it was actually written; and knowing that stories are often bought 6-9 months before they appear, I wondered if the appearance of this story in this issue was a coincidence or not. Maybe Scott can answer that question. I’m hoping to squeeze in at least one more issue before I start on my vacation in the Golden Age of science fiction. 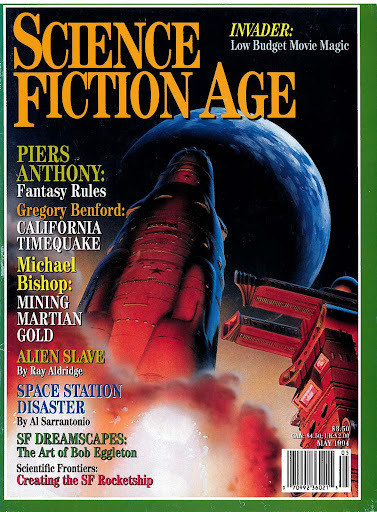 The July 1994 issue of Science Fiction Age looks to be a lot of fun, and contains the story that I think should have won the Hugo and Nebula–but more on that next time.